These 9 amazing cookie recipes without butter or margarine will amaze you! It’s pretty impressive how much times have changed. In the nearly four years since I started my blog, margarine (the old go-to sub for butter in non-dairy cookie recipes) has gone from totally-acceptable to something that people avoid as much as possible. Yes, I still use margarine – but only in recipes where you simply can’t avoid it – like pie crust, frosting, etc. But lately, because I listen to my readers, I’ve been minimizing my use of margarine as much as possible. In fact, almost all of the cookie (and all!) recipes in my upcoming cookbook call for oil, not margarine, unless I simply couldn’t find a way to make it work. So I decided to gather my cookies without butter or margarine together into one handy post for y’all. I know you keep asking for it, plus I want to make sure you don’t miss any of these delicious options! If you love coffee and you love cookies, you need to try these fabulously flavored crinkles. And of course…just oil! The texture of these cookies is simply magical – you won’t believe you can get it with oil! Not to mention the amazing citrusy flavor that bursts from these cookies! Pumpkin lends an incredible flavor and texture to any baked goods, and these pumpkin crinkles (made without butter or margarine, of course!) are no exception! Delightfully different, you’re going to love the fall flavors of these biscotti. The most popular cookie recipe on this blog, and for good reason. Everyone loves a great chocolate chip cookie recipe, and apparently, over a quarter of a million people are looking for cookie recipes without butter or margarine – and found these! Loaded with so much goodness, you won’t even miss the butter or margarine in these cookies! The flavors of your favorite candy, all combined into a dense, peanut-buttery, delicious cookie! Originally meant as hamantaschen, roll these cookies in a ball, stuff them with fluffernutter filling, and bake. You won’t believe how addictive these are! 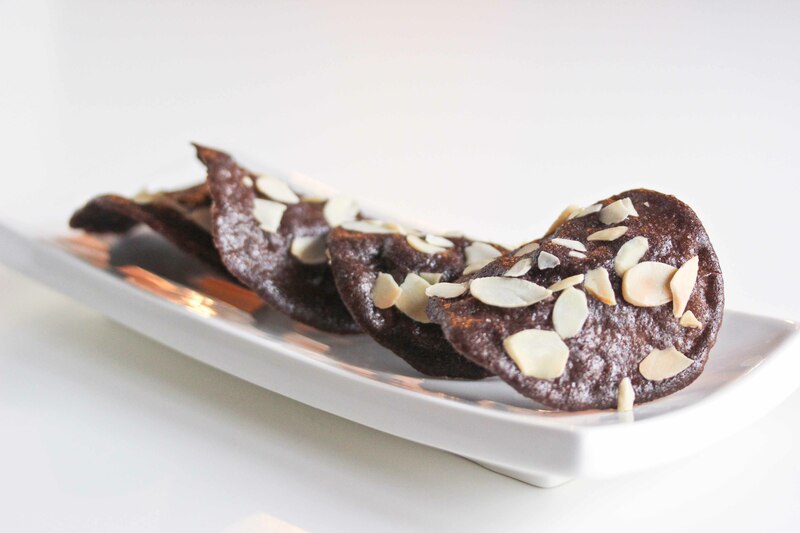 These wafer-thin chocolate cookies have a fun shape and a great taste. Best of all? They’re gluten-free! Still looking for cookie recipes? There are a ton of them here. Cookie sheets: Good quality cookie sheets are important for cookie baking. Don’t use the dark kind – they can cause the bottoms of your cookies to stick. Like These Recipes? You will absolutely LOVE my cookbook! It also makes a great gift! Click here to purchase Something Sweet. Make sure to follow me on your preferred social media channels to stay updated on all the latest recipes! I have tried one of these, your chocolate chip cookie recipe and it was just mediocre. I tried it one more time because of the reviews; and it still lacked something. I will try these other recipes- I really like butter and margarine alternatives in baking. I love peanut butter cup cookies ??? You wrote that pie crust won’t work without margarine. What do you think of this recipe? It has good reviews. I have lots of vegan runner friends — can’t wait to try a few of these for a post-run treat. Thanks for sharing! What an awesome collections! I really like baking without margarine! Thanks for sharing! Your chocolate chip cookies are amazing!!!! They are the only chocolate chip cookie we will ever make! All the other ones I’ve made in my life don’t come anywhere near it! I’ve added your recipe into chocolate chip cookie brownies pie, and chocolate chip cookie cheesecake. Amazing!! I have passed the recipe on to many many people . Thank you so much! Currently in the process of making your coffee crinkle cuts, and they smell incredible! Will report back! They don’t sell muzon products in Israel. What can I do to my diced apples to make them usable in this recipe? Use diced apple chips for best results. When you say flour is it plain or self-raising? We just made the Oatmeal Peanut butter chocolate chip cookies. The dough was a little crumbly so we carefully used our hinged scoop to put them on baking sheet. They didn’t spread out much, which is nice. I baked for 9 min, took them out, pressed them down just a little bit and baked another 3-4 minutes. Carefully took them off baking sheet to and they set up nicely. They are very tasty! We printed the recipe and will make again. Trying to think why they are a bit crumbly in the raw dough stage tho. Thanks for the recipe!! Would like to make the coffee cookies . Would they work out without rolling them in any kind of sugar?